Understand the importance of health insurance and why you should buy a policy for yourself. 1. What is Health Insurance? Health insurance is an agreement whereby insurance company agrees to undertake a guarantee of compensation for medical expenses in case the insured falls ill or meets with an accident which leads to hospitalization of the insured. Generally, insurance companies have tie-ups with the leading hospitals so as to provide cashless treatment to the insured. In case the insurance company has no tie-ups with the hospital, they reimburse the cost of expenses incurred by the insured. The government also promotes health insurance by providing a deduction from income tax. Buying a health insurance policy for yourself and your family is important because medical care is expensive, especially in the private sector. Hospitalisation can burn a hole in your pocket and derail your finances. It will become even tough, if the person who brings in the money, is now in a hospital bed. All this can be avoided by just paying a small annual premium which would lessen your stress in case of medical emergencies. A good health insurance policy would usually cover expenses made towards doctor consultation fees, costs towards medical tests, ambulance charges, hospitalization costs and even post-hospitalization recovery costs to a certain extent. 1. Cashless Treatment: If you are insured, you can get cashless treatments as your insurance company would work in collaboration with various hospital networks. 2. Pre and post hospitalization cost coverage: Insurance policy also covers pre and post hospitalization charges up to the period of 60 days, depending on the insurance plans purchased. 3. Transportation Charges: Insurance policy also covers the amount paid to ambulance towards the transportation of insured. 4. 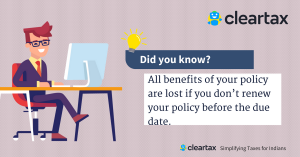 No Claim Bonus (NCB): This is the bonus element which is paid to the insured if the insured does not file a claim for any treatment in the previous year. 5. Medical Checkup: Insurance policy also provide options for health checkups. Free health checkup is also provided by some insurers based on your previous NCBs. 6. Room Rent: Insurance policy also covers room expenses depending on the premium being paid by the insured. 7. Tax Benefit: Premium paid on Health insurance is tax deductible under section 80D of the Income Tax Act. In India, people under 45 years of age are not required to undergo a mandatory health checkup when obtaining a health insurance policy. They are, however, required to disclose any pre-existing conditions such as diabetes or hypertension. It is, therefore usually advised that one should get a health insurance when young so that the premium would be less. 1. Age proof – Any one of Birth Certificate, 10th or 12th mark sheet, Driving License, Passport, Voter ID, etc. 2.Identity proof – Driving License, Passport, Voter ID, PAN Card, Aadhar Card, which proves one’s citizenship. 3. Address proof – Electricity Bill, Telephone Bill, Ration Card, Driving License, Passport, should clearly mention the permanent address. 1. Individual Health Insurance: This policy covers the health expenses and hospitalization expenses of individual who has taken the policy. Premium under this policy is determined as per the age of insured. 2. Family Health Insurance Plan: Under this policy, an individual can include all the family members against multiple diseases under a single cover. Family health plan offers a fixed sum assured for the family members, which can be availed by all members of the family or by any one individual in the family. 3. Senior Citizen Health insurance Plan: This policy is designed for the senior citizens or individuals over 60 years of age offering protection from health issues during old age. 4. Surgery and Critical Illness Insurance Plan: This plan is suitable for the insured that requires treatment against critical illness, such as kidney failure, paralysis, cancer, heart attack etc. As the medical expenses of these treatments are very high, the premium applicable to these types of policies is also high. 5. Maternity Health Insurance Plan: This policy covers costs, including pre and postnatal care, child delivery expenses of newborn babies. This policy is also covered for the newborn up to a certain period of time as mentioned in the plan. Ambulance costs are also covered. 6. Personal Accident Plan: This policy covers hospitalization expenses in the event of an accident. Premium amount is depending upon the amount of cover taken. 7. Unit Linked Health Plan: These plans offer a unique combination of insurance and savings both at the same time. This policy helps in building a corpus which can be used to meet those expenditures which are not covered by the insurance policy. The amount you pay towards health insurance premium claimed as a tax-saving deduction under Section 80D. You can claim ₹25,000 annually for a health insurance policy for yourself. If you also pay the premium for a health insurance policy for your parents, you can claim up to ₹30,000 for the same as well. Earning money is not at all useful if you don’t have a life. Think about yourself and your family and the importance of life. You know the importance and benefits of having a Health Insurance Policy. Start one, if you haven’t already. A health Insurance policy equips you to get the best healthcare treatment without worrying about the huge costs payable at the time of discharge. Therefore knowing about the claim process is an essential piece of information that the insured individual should be aware of at all times. When the insured individual provides their health insurance details to the respective hospital, he/she begins to receive treatment. Upon discharge, the hospital will forward the medical bills to the designated health insurance company. The company will then audit the expenses and settle the outstanding payment due to the hospital. This process is hassle-free for the insured as the payments are between the hospital and insurance company. In the reimbursement claim process, the insured individual who has been admitted to a certain hospital pays for the entire treatment until discharge. Once the insurer has paid for the treatment and hospitalization costs incurred, he/she have to make a reimbursement claim to the particular insurance company. The insured individual will have to provide original bills of the hospital to the health insurance and claim reimbursement. The insurance company will audit the claim and will then decide to approve or reject it. On approval of the insurance company, the claim will be made to the policyholder. The insurance company will notify the insured individual in case the claim has been rejected. Rashtriya Swasthya Bima Yojana (RSBY): This scheme was launched by the Ministry of Labour and Employment to provide health insurance coverage for families below the poverty line. The Beneficiaries under this scheme can avail a health benefits cover of up to Rs.30,000. A registration fee of Rs 30 is chargeable. Pradhan Mantri Suraksha Bima Yojana: Is an initiative by the government to bring access to insurance especially for the economically weaker sections of society. This scheme features affordable premiums and provides compensation to the family of the deceased. Central Government Health Scheme (CGHS): This scheme was launched in 1954. It provides comprehensive healthcare facilities to the central government employees, pensioners and dependents of these employees. Aam Aadmi Bima Yojana (AABY): This is a social security scheme launched in 2017 to provide healthcare facilities for rural landless individuals. The head of the household or earning member of a family will be covered under the scheme (AABY). The beneficiary should be between 18 to 59 years of age. The dependent of the beneficiary will receive Rs.30,000 upon natural death, Rs.75,000 upon accidental death or permanent disability, and Rs.37,500 on partial disability. Janashree Bima Yojana (JBY): This scheme was launched in August 2000. This scheme targets people falling below the poverty line (BPL) in 45 occupational groups covered under the scheme. Employment State Insurance Scheme (ESIS): This is a social security initiative aimed at providing socio-economic protection to the working class and their dependents. The scheme ensures that all member and their family will receive full medical care from day one. Universal Health Insurance Scheme (UHIS): The Indian public sector insurance companies have implemented this scheme to improve the access to healthcare for poor underprivileged families. Beneficiaries will receive reimbursement for medical expenses up to Rs.30,000 and accidental death cover up to Rs.25,000. The insurance premium for this scheme is Rs.200 per person, Rs.300 for a family of five, and Rs.400 for a family of seven. Oops. Something Went Wrong! Please try again later. Who should invest in equity funds?